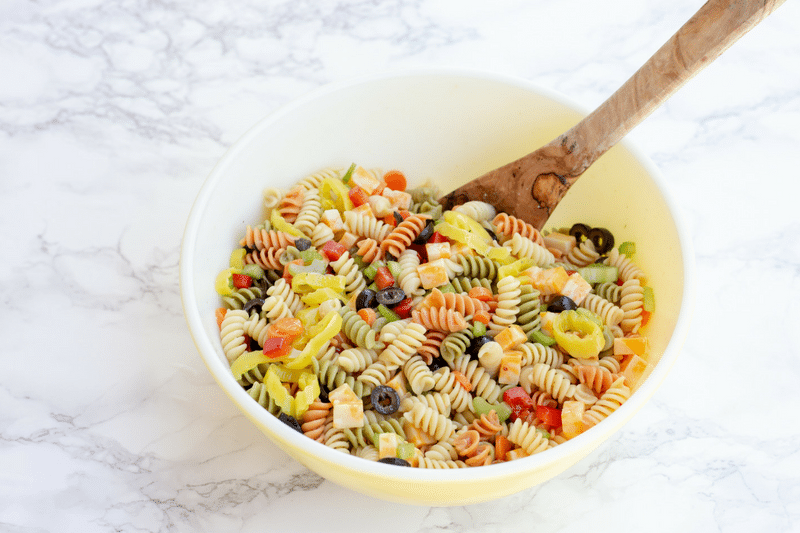 Pasta Salad – Freaking Easy Classic Recipe! This pasta salad recipe is an old family favorite. Colby-jack cheese, two kinds of peppers and tri-colored pasta are what makes this salad one of the best! 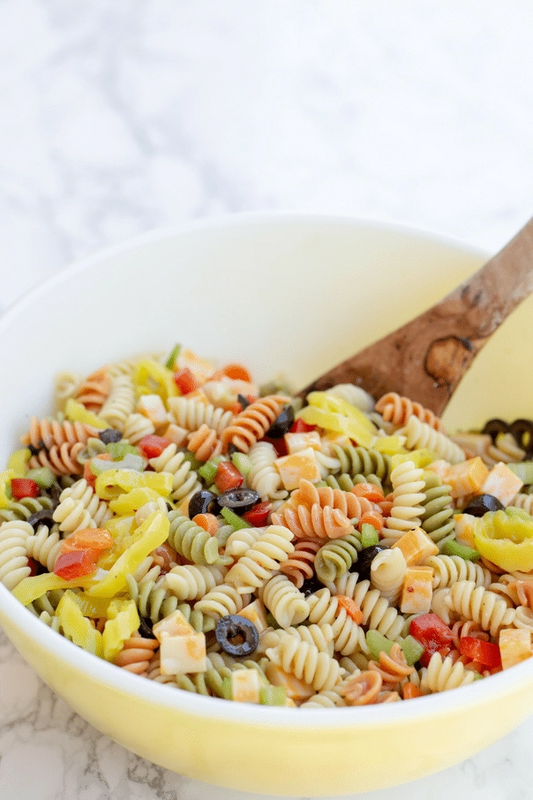 When summer comes, one of the first things I think about is this pasta salad. We have been making this same summer side dish for over twenty years. 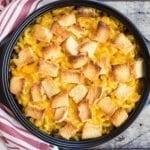 It has become one of my go-to side dishes for family events and gatherings. Sometimes I make it just because. It’s super easy to make and literally everyone in the family loves it. I recently made some for a family barbeque. In hindsight, I really should have doubled the recipe, because there wasn’t any left. Before you start this recipe, let’s make sure you’ve got the right tools. You really only need a few basics. Deep Colander – A deep colander gives you enough room to toss the excess water off of the pasta. Rubber husband – I know what you’re thinking and um, no. Just no. This amazing tool helps you open jars in a jiffy. Without the help of a husband. Salad Dressing Shaker – If you plan on using the dressing I use, you’ll need one of these. If not, fine, don’t get it. See if I care. This recipe really only has a few steps. Cook the pasta, chop the veggies, drain a couple of things, mix, pour, and chill. Set the water to boil first thing, since it takes the longest. Next, cut up all your carrots, celery, red pepper and cheese. Next, go ahead and drain the olives and pepperoncini peppers. Toss everything in the bowl you plan to serve it in. Less mess later. Make your dressing or use bottled. No one really cares. Once the pasta is done, make sure you rinse it with cold water while it’s still in the colander. Go ahead and skip that step if you like melted cheese in your pasta salad. Just ask my cousin. Put the pasta in the bowl and add the dressing. Mix it all up, stick it in the fridge covered with plastic wrap and you’re good to go. Make sure you stir it before you serve it. I even like to add a little more dressing., but you do what you want. 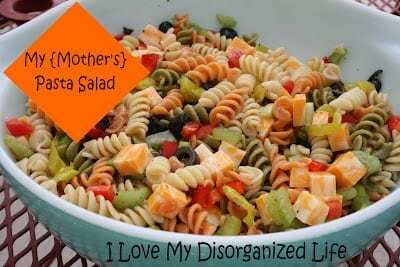 Just dropping in to check on your pasta salad:) Pinning!! 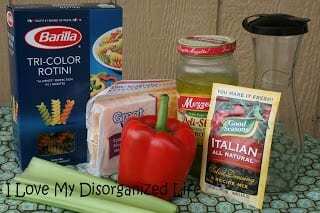 I love a good pasta salad but I have been unable to find one just the right ingredients:) I never thought about cheese cubes but I am loving it. 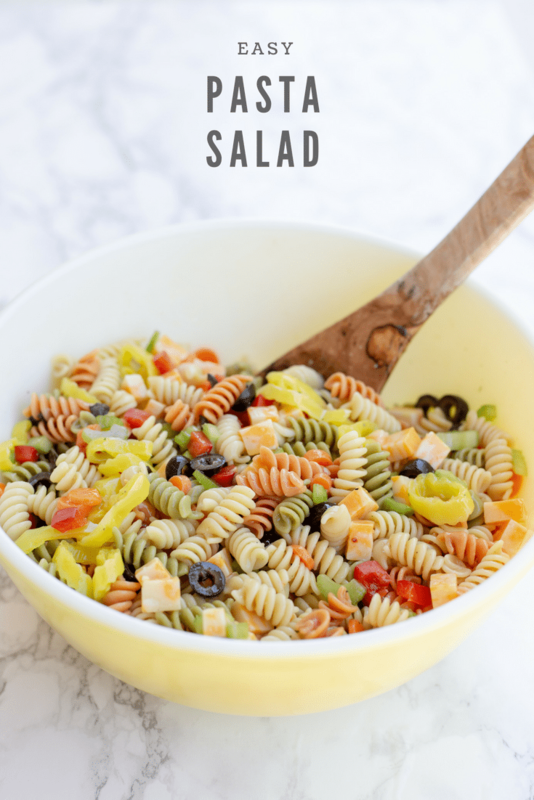 I love this pasta salad and I think you will, too! I would love to check out Freedom Fridays! Visiting from Online Blogcon. Just pinned this! I'm a HUGE fan of pasta salads in the summer, and yours looks fabulous, Rachel!